The Arizona Biltmore Resort has a long history as a golfing destination. Its beginning was as early as 1928, when it was built. Surprisingly, the vision for the Adobe Course came from William Wrigley Jr., from the gum fortune. As an avid golfer, he called in famed golf course designer -William P. “Billy” Bell to layout one of the areas first courses. It became a cornerstone of the fledgling golfing industry and a draw for many of the Early Hollywood Crowd. These wealthy helped give the Arizona Biltmore name recognition and spread the word. It has continued this tradition. The Adobe Course was restored and renovated in 2004 to have the look and feel of the original course. Known for wide fairways and cross- bunkering and generous greens it is sure to give the golfer a classic Southwestern Country Club experience. The Links Course is the newer course. It is a combination of old style English links meets southwestern golf and tall pines. You’ll see deep bunkers hug the greens with the desert ravines and five lakes. From the rolling terrain of the fifteenth hole you see the Phoenix and Scottsdale skylines and the surrounding mountain peaks. Both courses are known to challenge your shot making skills. It has been said that each day provides a new adventure in golf. Camelback Inn is part of the Marriott Resort system. It offers two acclaimed golf courses- The Padre and Indian Bend Courses. The Padre Course is a 6903-yard par-72 course designed by Arthur Hill. The course offers an opportunity to develop your game of golf strategy and features one of the “best water holes in Arizona” as noted in Arizona Golf Magazine. The Indian Bend Course is 7014-yard par 72 course that offers palm and eucalyptus trees lining a traditional American links course. Continental Executive Course is perhaps the most visitor friendly course for golfers in Scottsdale. It is close to Old Town Scottsdale. It opened in 1977. The course has two tee boxes with a maximum length of 3766 yards. It has a practice area and rentals for those who are close and want to brush up on your game. Desert Canyon Golf Club was built in 1970 as Fountain Hills Golf Club about 40 minutes from downtown Phoenix. It has a relatively short championship course with tight fairways and a combination of elevated tees and greens. Its location provides a quiet backdrop for a pleasant golf game. The Foothills Golf Club was designed by Tom Weiskopf and Jay Morrish . It is a links style course with four sets of tees so is enjoyable for many skill levels. Grayhawk Golf Club opened its first course in 1994. It was called The Talon, followed in 1995 by The Raptor Course. Both Golf Digest and Golf Magazine have recognized the courses as being among the best courses in the area. Both courses view the McDowell Mountains and contain an abundance of Saguaros, Ironwood, Mesquite and Palo Verde trees. The Talon Course was designed by David Graham and Tom Panks. The Course features the use of the natural desert growth and box canyons to provide the challenge as you position your shot from the tees. Distance and accuracy are a premium and will keep you out of trouble as you hit towards the multi-tiered greens. The Raptor Course was designed by Tom Fazio. It is 7135 yards. Although water hazards are few, it uses the strategically placed natural bunkers to create a challenging game of golf. The undulating greens are large but difficult. The Raptor course was selected to be the site of the 2007 Fry’s Electronics Open, not to be confused with the Frys.com Open held in Las Vegas the previous week. The Legacy Golf Club seeks to preserve part of the legacy of the Phoenix heritage. The location of the course is part of sight of the 7500 acre ranch of Dwight B. Heard. Some relics of this past are along the layout of the course. It is a Gary Panks design that offers a course suitable for all skill levels. There are rolling terrains that have numerous hazards and lush vegetation. Because it is close to South Mountain it offers elevation changes and breath-taking views of Squaw Peak, Camelback Mountain, and downtown Phoenix. Legend Trail Golf Club is a 6845-yard Rees Jones golf course set in North Scottsdale in the Carefree/Cave Creek area. It has four sets of tees and is considered a woman-friendly course. 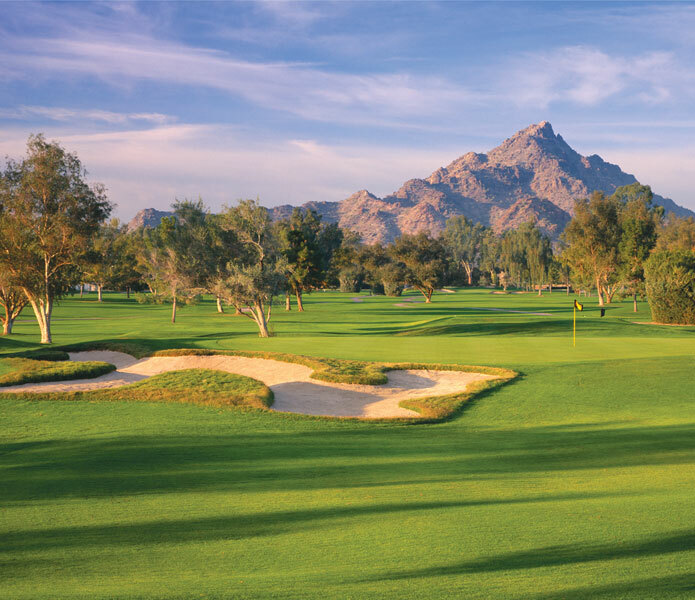 The wide fairways and views of Pinnacle Peak make it a wonderful experience for most golfers. McCormick Ranch Golf Club is one of the areas most popular courses. It has two courses, The Palms and The Pines. The Palms has 10 water holes and an abundance of palm trees. The Pines is narrower with an abundance of pine trees. Mountain Shadows is a 3081-yard Executive course located so that its signature 12th hole leads right into the foothills of the famous Camelback Mountain. It is a well-manicured course reputed to have one of the most beautiful views of the sunset in the valley. Orange Tree Golf Club is part of the Orange Tree Resort. It is a full-service golf resort offering a golf shop, lessons and a complete practice area. The course was designed by Johnny Bulla and opened in 1957. It is a traditional designed 6762-yard course and has mature vegetation, over 100 sand traps, wide fairways and gently sloping greens with many mountain views. Phantom Horse Golf Club is located at The Pointe South Mountain Resort. It is a 6336 -yard course with a famous island green on the 18th hole. It offers a combination target golf and links-style in a beautiful resort setting. The Phoenician Resort is a 27-Hole golf facility offering a pro-shop and complete practice areas. The courses are The Canyon, The Oasis, and The Desert depending on the terrain of the course. Designed by Ted Robinson Sr. and Homer Flint, the course consists exhibits mountain views, desert vegetation and complicated water hazards. The Resort is ranked one of the “Top 75 Golf Resorts in America” by Golf Digest. The golf course is managed by Troon Golf. The Raven at South Mountain was the first Raven Course in 1995. Because it received such a warm welcome more Raven courses were added. The name is synonymous with quality. The team of Gary Panks and David Graham designed a course different from most Phoenix courses. They brought in 6000 Georgia Pines to line the rolling fairways. Large multi-tiered greens with sand and sod bunkers added to enhance the difficulty of the over 7000-yard course. The facility has wonderful practice areas and has been called the “#1 Guest Service in North America” by Golf Digest. Scottsdale Silverado is a 6313-yard championship course that is in partnership with the City of Scottsdale. There are 3 tee boxes that offer a good game of golf for many skill levels. It is a par-70 18-hole in a strikingly beautiful setting. The Starfire Golf Club is located at Scottsdale Country Club. It is a 27-Hole course. The “King” was designed by Arnold Palmer and opened in 1988. It is 3253-yards from the championship tees. He redesigned the “Squire” (2758 yards from the championship tees) and “Hawk” (2840 yards from the championship tees) courses adding difficulty and more water hazards. The Tonto Verde Golf Club is located in the historical Indian land along the Rio Verde River. Originally part of the Box Bar Ranch, developers created the Rio Verde Development. When more land was needed they bought Federal land and it became Tonto Verde. Opened in 1993 the first course was called The Peaks was 6744 yards and was designed by David Graham and Gary Panks. The second course The Ranch is a Gary Panks design that opened in 1999, with 6988 yards. Because they were purchased later they are surrounded by public land. This allows for a very openness to the course. Redone in 2006 is the newest addition to the Tonto Verde Golf Club– the Vista Verde Golf Club. Wigwam Golf Club was one of the original clubs that drew golfers to the Phoenix area. It opened in the 1930’s as one of the original Robert Trent Jones Sr. Courses. There are three 18-Hole courses named the Gold, the Red and the Blue. The Gold and The Blue Courses set out to showcase Jones’ ability to combine natural beauty and strategy into the course design. In 2005 the resort renovated and restored the course to its original designs, thus creating a unique experience. The Gold Course was lengthened to nearly 7400-yards and is a” Southwest version of Firestone”. The Blue Course has a famous “island hole” and its 17th hole is a mirror of the 16th hole at Augusta. It is shorter with 6001-yards but has deep bunkers, ponds and dogleg fairways to add to the challenge. The Red Course was designed by Red Lawrence and meanders through luxury neighborhoods and tall trees with ponds and lakes added to complicate your game. Wildfire Golf Club in Phoenix is part of the Desert Ridge Resort, which was listed as one of “2006 World’s Best Golf Resorts” by Travel & Leisure Golf. It has received many awards. The Resort offers a complete practicing area, well-stocked golf shop, and specialized golf instruction for individuals and groups. The biggest reason is the Wildfire Golf Course. It has the distinction of having two courses designed by two of golf’s greats. There are The Arnold Palmer Signature Course and The Nick Faldo Championship Course. They have large undulating bentgrass greens, and many holes highlight the Sonoran Desert landscape. The 7145-yard Palmer Course has wide fairways with many strategically positioned bunkers. The Faldo Course is 6846-yards long with more of an Australian sand belt course feel. Saguaro cactus and spectacular views greet the golfer on many holes. The Paradise Valley/Phoenix/Scottsdale, Arizona area has a different feel than many of the other parts of the Southwest. There’s a freshness that comes from looking at the Superstition Mountains, the large Saguaro cactus, or the open spaces. Over the years it grew up and has become one of the most famous golf destinations in the world.